Jumbo learns that a lesson can be taught harmoniously. Jumbo elephant had a beautiful garden with different varieties of flowers. Gardening had become his passion. He planted new trees, flowering bushes and maintained his garden very well. “Trees and plants are the pride of the Earth. They are the one to provide us with life,” sang Jumbo while watering his plants. 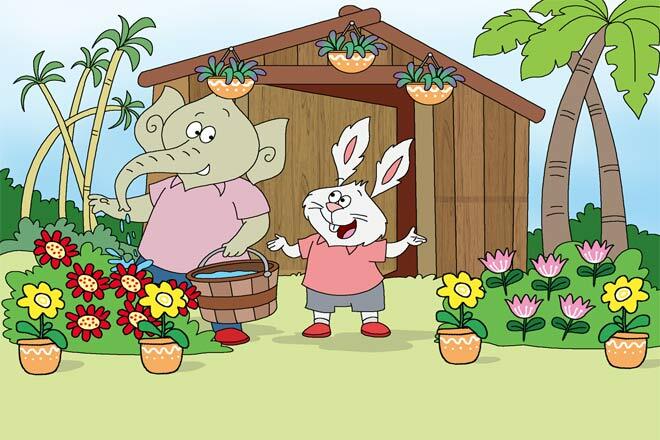 “Wow Jumbo, you have such beautiful flowers in your garden!” said Cheeku rabbit as he was crossing Jumbo’s house. “Oh thank you, Cheeku. 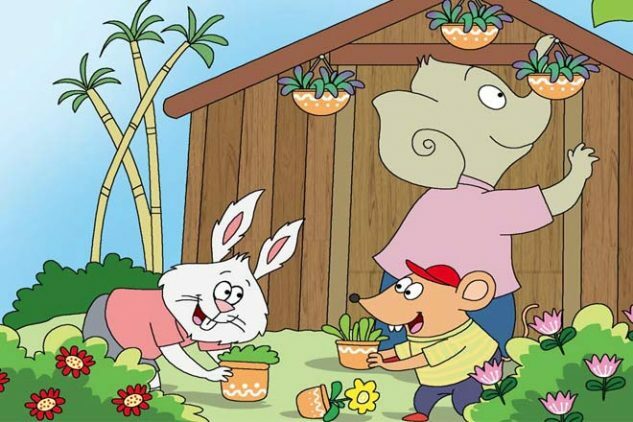 I love to take care of them,” said Jumbo while looking at his plants lovingly. “You sure do. If I need some flowers for my house, I will take them from your garden only,” said Cheeku, touching one of the flowering plants. Jumbo was not happy with what Cheeku had said. “Beware Cheeku. Don’t you dare touch that flower!” he said. “What happened Jumbo? Why are you getting so mad at me?” asked Cheeku, a little shocked. Cheeku did not seem to agree with what Jumbo was saying. “It is not so Jumbo,” said Cheeku. This made Jumbo angrier. “Come here, I will pick you up and throw you down. Then let’s see whether you feel the pain or not,” he said angrily. Jumbo quickly moved his trunk towards Cheeku to scare him. Cheeku ran away from there. “Cheeku is worried about his pain. For him, it is fun to crush plants and pluck flowers. He does not think how much pain my dear plants will feel if he plucks them,” Jumbo mumbled to himself. He took a good look at his garden once again and went inside the house. 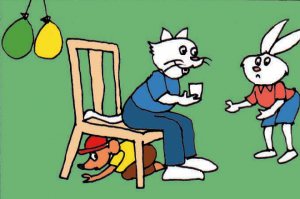 In the evening, Meeku mouse was passing by Jumbo’s house, riding his bicycle. As he was crossing Jumbo’s garden, Meeku’s bicycle wheel got stuck in a pothole and he lost his balance. Meeku fell down on a bush in Jumbo’s garden along the road. Some plants and flowers were crushed because of Meeku and his bicycle falling on them. Jumbo was reading inside his home when he heard the loud noise of the crash. He rushed out to see what had happened. Jumbo was furious to see his plants damaged, the flowers crushed and the mud scattered all around. Meeku tried to explain his side of the story but Jumbo was in no mood to listen. He wrapped his trunk around Meeku and picked him up. “Jumbo, forgive me. I did not do this on purpose. I lost my balance because of the pothole and crashed into your garden,” pleaded Meeku. But Jumbo was still furious. “If you don’t know how to ride a bicycle then you shouldn’t ride it. I am not going to listen to any of your excuses. Today I will show you what pain is,” Jumbo continued as he shook Meeku with his trunk. Meeku was too scared. Jumbo was just about to throw him to the ground when Cheeku came there. “Jumbo put Meeku down! You’ve been thinking of the pain we would cause to your plants but are you thinking about the pain you’re putting Meeku through? He has been your friend for so many years and yet look at the way you’re treating him,” said Cheeku loudly. Jumbo was surprised with what Cheeku had just said. “What are you saying Cheeku?” said Jumbo, calming down. Jumbo realised his mistake. “I am sorry Meeku,” he said. “I forgot that it is wrong to hurt others for my love of plants. I will not hurt others to give this message,” said Jumbo as he placed Meeku on the ground. Jumbo then started to clear the destroyed plants and both Meeku and Cheeku helped him in the garden work. Jumbo realised that his blind love for plants had been hurtful to his friends. He now knew that both were equally important. Food gained by fraud tastes sweet to a man, but he ends up with gravel in his mouth.